For the past few years, more and more municipalities are requiring RPZ backflow preventers on domestic lines. The main reason for this is increased protection. You've probably already read all about the differences between DC and RPZ valves. There are also many building uses that are classified as high hazard. Most municipalities consider buildings such as hospitals, restaurants, and even laundromats among a variety of others as high hazard. It's becoming more rare for a domestic line on a commercial building to be low hazard. Similarly, most irrigation lines are classified as high hazard by default. Fire protection lines, on the other hand, get much more complicated. Most fire protection lines only require a low hazard level backflow preventer - a double check detector assembly. There are multiple instances in which a fire protection line would be considered a high hazard instead. There are deluge systems, dry pipe systems, pre-action systems, and wet pipe systems. Most wet pipe systems are considered low hazard and have a double check detector device for protection. The exception to this is wet pipe systems that have added chemicals such as an antifreeze solution or a corrosion inhibitor. All fire lines with added chemicals are considered high hazard. One could argue, however, that even lines without added chemicals could pose a health hazard. According to PM Engineer, "The majority of the wet-pipe fire sprinkler systems installed in these industrial and commercial facilities utilize black steel piping. This tends to generate water quality issues, as the water becomes stagnant in the piping system, allowing the chlorine residual to dissolve and the heavy metals from the pipe to leach into the water." They also note that a check valve is installed to keep this water from backflowing, but that is not considered an actual backflow device and can't be tested. It's unclear whether they think that check valve should be sufficient in protecting the public from contaminants. 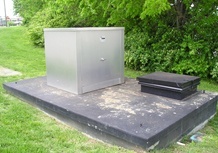 There isn't any standing water in dry pipe, deluge, and pre-action systems. They are also typically protected with a double check or double check detector valve rather than an RPZ. These types of fire protection are uncommon. Wet pipe systems are the most commonly used and the most economical option for fire protection today. One of the main arguments for RP or RPDA backflow preventers on fire protection lines is that things change. The designer may specify a low hazard device, but the building use or fire protection line may change and require a high hazard device in the future. Sometimes this leads to a retrofit and an RPZ must be installed in place of a double check. You can see the aftermath of this in the image to the right. There is also the chance that the owner decides at a later date to include chemical fire protection, and water managers and fire marshals may not even be aware of the increased danger. Additionally, the owner may operate a dry pipe system as a wet pipe system without knowing the risks associated. If the design engineers do not specify RP or RPDA in the planning stages, then the standard DC or DCDA in a vault will be incorrectly installed and the water supply will not be sufficiently protected. We learned during our recent backflow vault panel discussion from an attendee that Connecticut requires most if not all fire lines to be protected by an RPZ because of these possibilities. That is not a common stance for the water authority to take. Plumbing, mechanical, and fire protection engineers are far more likely to specify a double check than a reduced pressure zone. The reason for this is pressure loss. Why is Pressure So Important? "When the first sprinkler operates during a fire event, the compressed air pockets in the system will attempt to equalize to atmospheric pressure and force the water through the operating sprinkler. 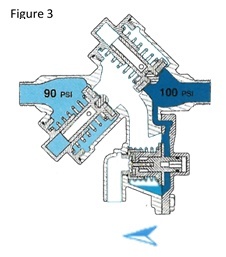 When the pressure within the system becomes less than that of the water supply, it will cause the reduced pressure principle backflow prevention assembly to open, sending a slug of water into the piping system and repressurizing the air pockets. Then the reduced pressure principle backflow prevention assembly will close abruptly. This immediate closing of the assembly will cause significant water fluctuations within the aboveground piping system. The relief valve on the backflow preventer might sense this pressure fluctuation, causing the relief valve to open and discharge. It is understood that the relief valve should close once the pressure in the intermediate zone of the reduced pressure principle backflow prevention assembly is relieved. However, there have been several instances where the performance of system testing utilizing the inspectors test connection has caused the relief valve to open and stick in the open position. 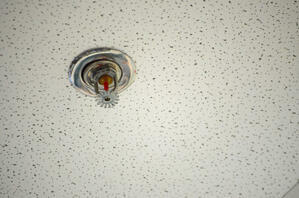 This may prevent the sprinkler system from receiving an adequate water supply to control or extinguish the fire." The decades old debate is still going on. Both those in favor of the maximum backflow protection and those in favor of minimal backflow prevention can agree on one thing. Each building and situation needs to be analyzed so that the right protection can be specified and installed. In a recent article on backflowpreventionjournal.org, Sean Cleary discussed this same topic. He came to the same conclusion saying, "In far too many areas we have an all or nothing approach to backflow protection. We need to look at each installation for the hazard it presents and then install the proper protection." Just because backflow isn't a glamorous, frequently discussed topic, doesn't mean it won't happen. Analyzing each cross connection for hazard, with consideration for the future, is of the upmost importance.